Original name of al-Khwarizmi was Muhammad Ibn Musa al-Khwarizmi. In addition, he identified as Abu Abdullah Muhammad bin Ahmad bin Yusoff. Al-Khwarizmi in the West known as al-Khwarizmi, al-Cowarizmi, al-Ahawizmi, al-Karismi, al-Goritmi, al-Gorismi and some way of spelling anymore. He was born in Bukhara.Tahun 780-850m is the glory days of al-Khwarizmi. al-Khwarizmi had died between the years 220 and 230m. Some say al-Khwarizmi lived about the beginning of the mid-9M. Another source confirms that he is alive Khawarism, Usbekistan in 266H/850M 194H/780M and died in Baghdad. In education has been demonstrated bahawa al-Khwarizmi was a knowledgeable Muslim leaders. Knowledge and expertise not only in the field of Shari'a but in the fields of philosophy, logic, arithmetic, geometry, music, arithmetic, history of Islam and chemistry. He has created and Tangen Secans use trigonometry and astronomy in the investigation. In young age he worked under the Caliph al-Ma'mun, work in Bayt al-Hikmah in Baghdad. He worked in an observatory is a place to learn mathematics and astronomy. Al-Khwarizmi also believed to lead the library of the Caliph. He has introduced India figures and calculation methods of India in the Islamic world. He is also an author of the Encyclopedia in various disciplines. 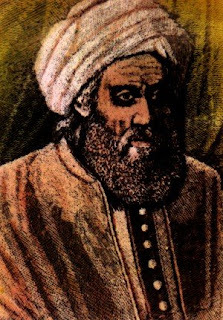 Al-Khwarizmi was a character who first introduced algebra and computation. Much more knowledge he learned in the field of mathematics and mathematical concepts result in a so popular that is still used today. 1. Al-Jabr wa'l muqabalah: he has created and tangens secans use trigonometry and astronomy in the investigation. 2.Hisab al-Jabr wa al-muqabalah: He has submitted examples of math problems and put 800 pieces of matter that most of the issues raised by Neo. Babylian in the form of allegations that have been substantiated by al-Khwarizmi. 3.Sistem Number: He has introduced the concept of nature and it is important in a number system today. His work on this one contains Cos, Sin and Tan in the completion of trigonometric equations, and the isosceles triangle theorem calculation of triangles, rectangles and circles in geometry. Many other concepts in mathematics that have been introduced al-Khwarizmi. The field of astronomy also made famous al-Khwarizmi. Can be defined as the science of astronomy Falaq [knowledge of the stars, which involves the study of the positions, movements, and thoughts and commentaries related to the star]. Al-Khwarizmi's personality has been recognized by the Islamic and Western world. This can be proved bahawa G.Sarton said that "the highest achievements have been obtained by the Eastern people ...." In this case the Al-Khwarizmi. Another character, Wiedmann said .... "al-Khwarizmi had a strong personality and a person who dedicated his life to the world of science". Some branches of science in mathematics that are introduced by al-Khwarizmi such as geometry, algebra, arithmetic, and others. Geometry is the second branch of mathematics. Uterine contents discussed in this second branch is the origin of geometry and its main reference is the Kitab al-Ustugusat [The Elements] Euklid works: geometry derived in terms of language than the Greek words namely 'geo' meaning earth and "metri" means the measurement . In terms of science, geometry is the science that examines matters relating to the magnitude and the properties of space. Geometry is studied from the time of the pharaohs [2000SM]. Thales of Miletus introduced later Egyptian geometry to Greece as a science in the period 6th century BC. Islamic scholars have so perfected the rules of science education is primarily on ke9M century. Algebra/Algebra is a mathematical pulse. Al-Khwarizmi's work has been translated by Gerhard of Gremano and Robert of Chaster into Europe in the 12th century. before the appearance of a work entitled 'reckoning al-wa al muqabalah Jibra written by al-Khwarizmi in 820M. Prior to this there is no algebraic term.